It’s National Selfie Day, and as someone who does social media for a living (but isn’t exactly the queen of selfies), I had a good long think on the number of reasons I would not be posting a selfie today - and the winner, winner chicken dinner was clearly the current state of my unedited face. Put away your Kim Kardashian beauty editing app, because it ain’t gonna help this hot mess. I am now 3 weeks into the throws of a chemo-rash that far surpasses anything I dared complain about at the start of this regime 6 months ago. There is no logical medical explanation for why it has returned, and returned with such a vengeance. It currently looks like chicken pox mated with a swarm of Amazon-bred mosquitos and gave birth on my face. 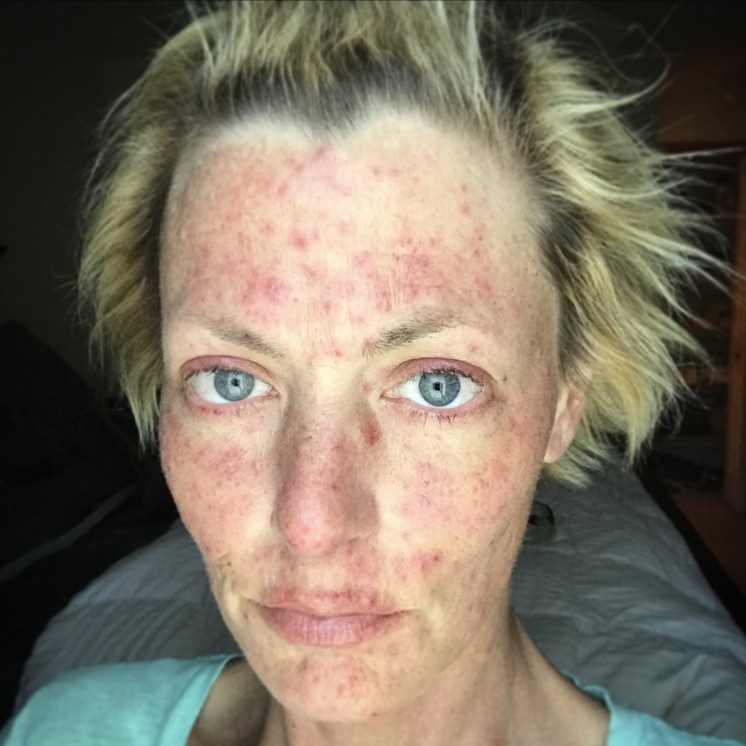 The general idea behind EGFR-inhibitor chemo is that you get a rash (and cracked bloody feet, nail infections, nails that have to be removed because of those infections, infected eyelids, cracked skin that has to be slathered in heavy cream twice a day, facial hair, and scabs on the inside of your nose that bleed if you even remotely try to pick them) and getting a rash is apparently a good thing. The worse the rash, the better the chemo is working. This theory proved correct with my first 2 scans. Pending insurance approval for an earlier-than-needed scan, I will have to wait another 7 weeks to find out if this magical plethora of welts upon my face (and infected eyelids) is indeed the neon sign that the rash-inducing chemo has decided to get back to "significantly shrinking" after the half time show break. So to force myself out of hiding on a day when everyone is putting their prettiest face forward, I'm closing the beauty editing app and putting this out there for all to see. Sometimes airing our dirty little secrets releases the hold they have over us. So for me, I'm going to air out my nasty little face and release the hold it has over me. Happy National Selfie Day. Here's mine. I love you, Sarah DeBord! Sending Love to you my friend!! I'm glad you decided to post this. I love how real you are. I hope your results show amazing shrinkage!!! Thinking of you and praying! Daughter, you continue to amaze me at the "in your face" approach you have taken as you have shared your journey with colon cancer from the beginning of your journey. I am sad this is another issue you have to walk through on this journey. I am proud of your courage to never let cancer define who you are. As my Dad said to me, "I'm rooting' for you." You are beautiful, rash be damned.